Similar to a power of attorney, but offering less authority in comparison, IRS Form 8821 authorizes a person or organization to both receive and receive a copy of filed tax returns and inspect a person’s confidential information pertaining to their taxes. Form 8821, also known as a “tax guard” by many, allows third-party institutions, that are authorized to work with Tax Guard to pull tax lien transcripts and obtain copies of your filed business and or personal tax returns from federal and local taxing authorities. Regardless whether your a sole proprietor, LLC S corp or C corp signing a tax guard will allow underwriting to get a filed copy of the returns. This is mainly used to verify information received when applying for a business loan and to confirm that no outstanding tax liens or judgments are existent. Keep in mind that Form 8821 doesn’t allow a third party to represent you with the IRS, so any person obtaining a form 8821 will still need to file a power of attorney if they are looking to represent you or make any changes to your tax status. The Form 8821 offers several useful benefits for business lending institutions and may require this form when underwriting business lines of credit or loans over a certain dollar amount. Typically over $150,000.00. There are 3 primary benefits to filing Form 8821. First, by filing this form with a client, IRS notices will be sent to you in addition to being sent to the client, often several days before they receive their notice. This is useful for a number of reasons, most notably because it allows you to promptly take care of potential issues for the client and to do so in a timely manner as they’ll often have not received their own notice yet. Second, unlike power of attorney, the IRS allows you to list your practice as the appointee on Form 8821. This is useful because it offers you flexibility, giving anyone in your office the authorization to obtain information on behalf of the client, helpful in case you’re overloaded with client work and need to delegate tasks off to others. Lastly, a Form 8821 automatically expires, as opposed to requiring a manual cancellation as in the case of a power of attorney. This is useful if all you need is the client’s tax information and have no need to represent them officially. ,like all tax forms, has a lot of information, boxes, and areas that can be filled in. Don’t let that discourage you, there are really just four areas you need to be most aware of when it comes to filling out Form 8821. If you dont know your Tax ID number please locate your form ss4 or tax return. Second, once you’ve entered your client’s information, Appointee is where you enter your information and the information of any additional appointees. Once each party’s basic information is inputted, second 3 is where you enter the exact tax information that either you (if you’re the company providing the service) or they (if you’re the client filling out the paperwork to be given to the company providing you the service) are allowed to view and edit. Keep in mind that this information could be an entire tax year, a type of tax, a single form, or a more specific tax matter as seen in the image above. 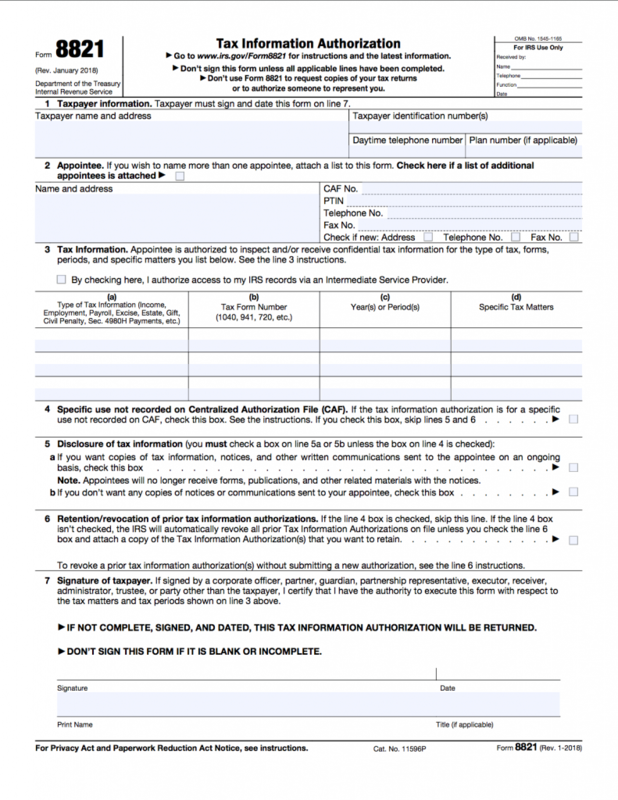 Again, keep in mind that this is just a general overview of how to fill out the major sections of Form 8821. If you’d like a more detailed, step-by-step explanation of each section of the form go to. So, when should you file Form 8821? There are two primary ways you can do it, each useful depending on your needs and workflow. First, make it a regular part of your client sign up process. By doing so, it’s much easier because you won’t have to circle back around later and request they fill out an additional document which can lead to questions. Second, simply complete Form 8821 for each of your clients simultaneously with their return each year. By taking care of it in the same meeting with your client (similar to the first method), it’s far more convenient for them and easier for you to get it done. Form 8821 is a simple and straightforward tool for obtaining your client’s tax information. When and how you decide to file it with your clients is up to you. However, what’s most important is simply that you have your clients complete it so that you’re notified any time there may a problem.